Jaded Blossom: Have a Magical Birthday!!! Hi everyone...DT Lee-Ann(from Snappy Scraps) here with my first official post on the Jaded Blossom blog...so excited!!! 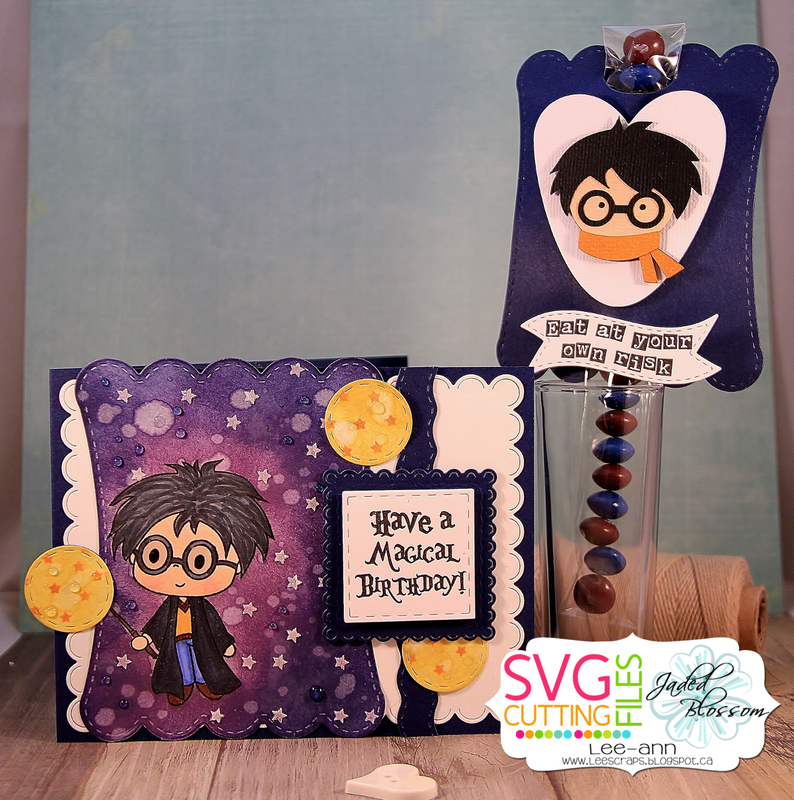 For today's post...I decided to channel my inner Harry Potter...I love Harry Potter!!! 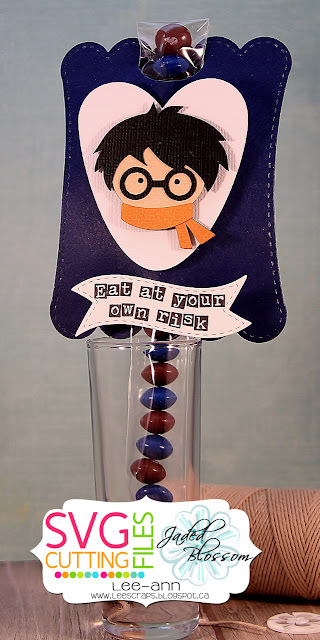 I whipped up a card and matching treat...I made a (hopefully) magical looking background with Distress inks. 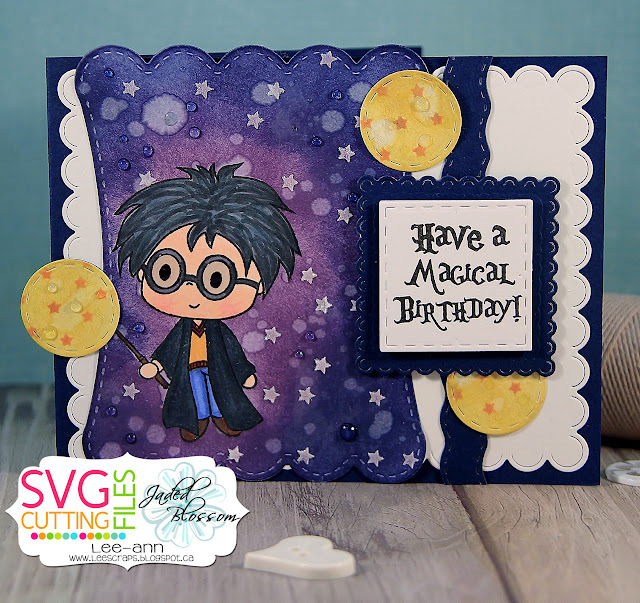 I coloured Harry(from the Jaded Blossom My Favorite Wizard stamp set) with Spectrum Noir markers then masked him off to ink blend a background on the Scallop Slider topper die...I added water droplets and then added embossing paste stenciled stars over top...and then coated them in Glamour Dust for a sparkly look...I matted the piece using a Scallop square die that I cut and separated a bit to give the illusion that I covered the card base...and then covered the cut with a Border die piece...I added balls of magic with the Stitched circle dies...that I colored with Mustard seed distress ink...then I stenciled the stars on using Simon Says Sunshine ink...coated them in clear Wink of Stella. Liberal dabs of Glossy Accents here and there...and hopefully, BAM, a magical looking card. Such an awesome project. Maybe one day with practice I can start coloring half as good as you ladies. I really love this. Guest Designer Melissa- Scaredy Cat! Hope you day is super cool! Happy 1st Day of School! Customer Blog Hop Winners !!! Jaded Blossom August Stamp Release Blog Hop! Jaded Blossom August Sneak Day 3! Jaded Blossom August Sneak Day 2! Jaded Blossom August Sneak Day 1!